Apple last week unveiled two new variants of the all-new MacBook Pro in 13-inch and 15-inch sizes. According to Apple, both the new MacBook Pro are “the most powerful MacBook Pro ever,” because it’s lighter, thinner and more powerful from its previous generations MacBook Pro. Apple has done several new additions to these two new devices. below we have lined up all the major differences between both the new 13-Inch and 15-InchMacBook Pro Variants. Both the new MacBook Pro comes in Silver and Space Gray color options. Both MacBooks are thinner and lighter than their previous generations. Both comes with a larger Trackpad than the ones on the previous MacBooks, both MacBooks have got a redesigned keyboard for better typing. The 13-inch variant of MacBook Pro comes with a 2.9 GHz dual-core Intel Core i5 processor with Turbo Boost speeds up to 3.3 GHz, it includes 8GB of RAM and 256GB of flash storage. In terms of graphics performance both MacBook reaches “up to 2.3 times the graphics performance” than their previous generations where 13-inch model has Intel Iris Graphics. 13-inch model is 14.9 mm thin which is 17 percent thinner than its previous models and has 23 percent less volume, The 13-inch weight 3 pounds, which makes it half a pound lighter than their previous versions. Apple has also expanded the Trackpad to 50 percent larger than its previous versions in the 13-inch MacBook Pro. The speakers on the new 13-inch MacBook Pro has also been upgraded, with louder, more true-to-life sound including double the dynamic range and improved bass. The 15-inch variant of MacBook Pro comes with 2.6 GHz quad-core Intel Core i7 processor with Turbo Boost speeds up to 3.5 GHz, it includes 16GB of RAM and 256GB of flash storage.. In terms of graphics performance both MacBook reaches “up to 2.3 times the graphics performance” than their previous generations where 15-inch model features Radeon Pro discrete graphics. 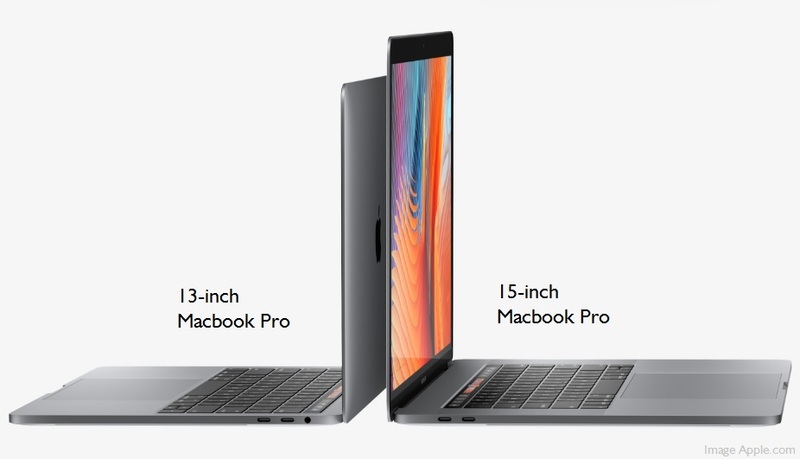 15-inch model is 15.5 mm thin which is 14 percent thinner than its previous models and has 20 percent less volume, The 15-inch model weight around 3 pounds, which makes it half a pound lighter than their previous versions. The biggest addition which Apple has made on the device is the new ”Touch Bar” which you will find placed at the top of the keyboard of your MacbookPro on both variants. 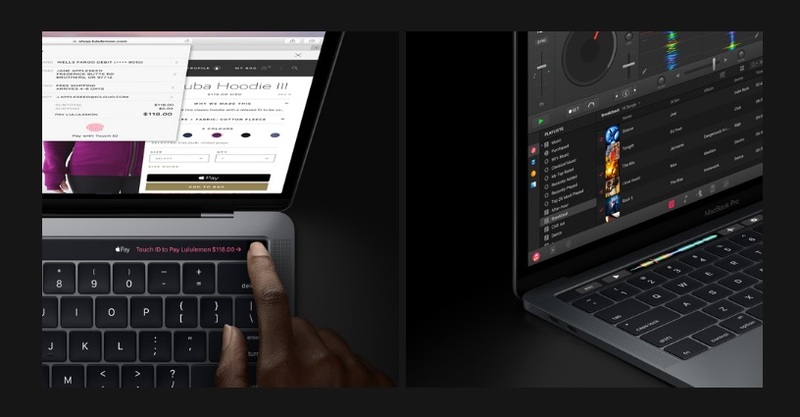 The new Touch Bar offers a unique new way of interacting with your device by replacing the usual function keys on the laptop. The application specific Touch Bar automatically adapts to what’s on your screen and also lets you choose to access Calendar, Photos, selecting emoji in Messages, receiving and rejecting a call and more, including third-party apps like Microsoft Office. The second big addition which has been made to the new Macbook Pros is the use of ”Touch ID,” which makes it the first ever Macbook Pro which features ”Touch ID”. The Touch ID on the new Macbook Pro has been integrated into the power button which can be used to simply lock the device just by pressing the finger on it. It also allows switching the user account and even users can make payments for their purchase through Apple Pay’s new integrations on the web. Both the 13-inch and the 15-inch Macbook Pro is now available for purchase. The 13-inch MacBook Pro starts at $1,799 (About 1,20,000 INR), while the 15-inch starts at $2,399 (1,60,000). Apple has also listed an entry-level MacBook Pro which comes without a Touch Bar on its website priced at $1,499.